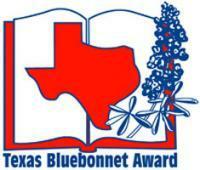 The Texas Bluebonnet Award is sponsored by the Texas Library Association. It was established in 1979 to encourage Texas children in 3rd, 4th, 5th and 6th grades to read more books. Each year, 20 books are chosen as the “Texas Bluebonnet Award Master List” by the TBA selection committee. If students read a minimum of five books from the current master list, they have the opportunity to vote for their favorite title during the month of January each year. The author of the book receiving the most votes statewide is declared the winner of the Texas Bluebonnet Award. Students that vote are eligible to participate in Sudderth's Battle of the Bluebonnets. This will be held in the spring. Students also have the opportunity to earn the Bluebonnet Award at school by reading at least 15 books from the current Texas Bluebonnet Award Master List. Visit the Texas Library Association Texas Bluebonnet Award Website where you can find links to publisher trailers, author interviews and more online resources related to the current Texas Bluebonnet Award Master List.